Dr. Kumar received his Bachelor of Technology degree from the Indian Institute of Technology, Kanpur and his Ph.D. from The Ohio State University in 1987. He has been on the Faculty in the Department of Mechanical Engineering and Applied Mechanics with a secondary appointment in the Department of Computer and Information Science at the University of Pennsylvania since 1987. Dr. Kumar served as the Deputy Dean for Research in the School of Engineering and Applied Science from 2000-2004. He directed the GRASP Laboratory, a multidisciplinary robotics and perception laboratory, from 1998-2004. He was the Chairman of the Department of Mechanical Engineering and Applied Mechanics from 2005-2008. He served as the Deputy Dean for Education in the School of Engineering and Applied Science from 2008-2012. He then served as the assistant director of robotics and cyber physical systems at the White House Office of Science and Technology Policy (2012 – 2013). Dr. Kumar is a Fellow of the American Society of Mechanical Engineers (2003), a Fellow of the Institute of Electrical and Electronic Engineers (2005) and a member of the National Academy of Engineering (2013). 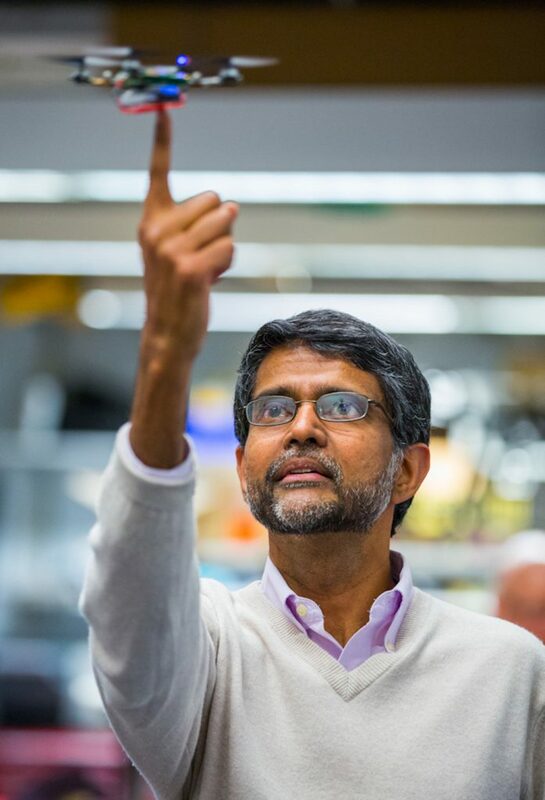 Dr. Kumar’s research interests are in robotics, specifically multi-robot systems, and micro aerial vehicles. He has served on the editorial boards of the IEEE Transactions on Robotics and Automation, IEEE Transactions on Automation Science and Engineering, ASME Journal of Mechanical Design, the ASME Journal of Mechanisms and Robotics and the Springer Tract in Advanced Robotics (STAR). He served as Editor of the ASME Journal of Mechanisms and Robotics from 2014-2017, and he currently serves as Advisory Board Member of the AAAS Science Robotics Journal. He is the recipient of the 1991 National Science Foundation Presidential Young Investigator award, the 1996 Lindback Award for Distinguished Teaching (University of Pennsylvania), the 1997 Freudenstein Award for significant accomplishments in mechanisms and robotics, the 2012 ASME Mechanisms and Robotics Award, the 2012 IEEE Robotics and Automation Society Distinguished Service Award, a 2012 World Technology Network (wtn.net) award, a 2014 Engelberger Robotics Award and the 2017 IEEE Robotics and Automation Society George Saridis Leadership Award in Robotics and Automation. He has won best paper awards at DARS 2002, ICRA 2004, ICRA 2011, RSS 2011, and RSS 2013, and has advised doctoral students who have won Best Student Paper Awards at ICRA 2008, RSS 2009, and DARS 2010.